Many cats love to curl up in small spaces such as cardboard boxes, small cat beds, cupboards, and in the backs of closets behind a bunch of clothes and shoes. 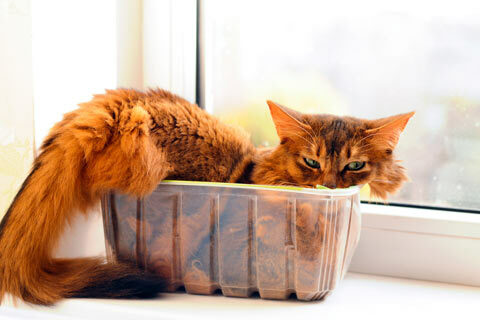 Do you know why cats like to hang out in small spaces? Our domestic cats' ancestors were predators, as are their wild cousins. They find a place to lie in wait and watch for prey to saunter past. Today's indoor kitties might not see a lot of rodents wandering past their hidey-holes, but they still enjoy watching their humans and housemates from a small, cozy spot where they feel invisible. When a cat is hanging out in a cardboard box, bed, or cat cave and sees something interesting go by, sometimes he'll leap out and pounce. This is also part of a cat's predator instinct; felines love to use the element of surprise to increase their hunting success, even if they're only hunting their humans' feet. Cats love to be warm. You'll often see them hanging out near or on heat registers. When a cat curls up in a box, cupboard, or cat bed, he can get all warm and cozy. Having a nice hidey-hole to retreat to can really help your cat manage stress. Being able to get away from other pets, kids, or people in the home and observe things on his terms is an important coping mechanism. In fact, a recent study done on cats that were going into a Dutch animal shelter looked at cats, stress, and the availability of a box (C.M. Vinke, 2014). Using a commonly accepted scientific scale for evaluating stress levels in cats, researchers determined that those that were given cardboard boxes to hide in were calmer than those that weren't. Many negative behaviors in cats, such as urinating outside the litter box and inappropriately scratching belongings, can be increased or even caused by stress. The interesting Dutch study tells us that cats that are provided with hiding spots at home may be better able to deal with stress, decreasing the risk of inappropriate behaviors. These special feline hiding spots are perfect for the cat that wants to curl up, get warm, and watch for "prey" to go by. They come in many lovely colors, so the humans in the home can enjoy them, too. 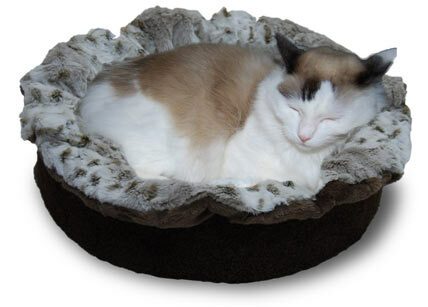 They're also handmade individually with all natural New Zealand wool, which is thick and cozy, and they're colored with natural vegetable dye that's safe for cats. 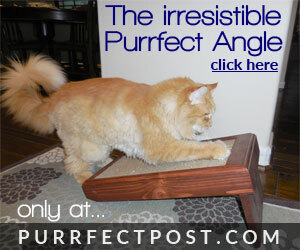 Dr. Schelling tested them out with her own cats before she decided to offer them on PurrfectPost.com, and she knew right away that they were a big feline hit. In fact, she had to get several so her cats could each have their own.